Calgary, Alta. — The Western Hockey League announced on Wednesday that Spokane Chiefs defenseman Ty Smith has been named Western Conference Defenseman of the Year as well as a Western Conference First-Team All-Star for the 2018-19 regular season. He joins Josh Brook of the Eastern Conference’s Moose Jaw Warriors as nominees for the league’s Bill Hunter Trophy for WHL Defenseman of the Year. Smith, who was selected by the New Jersey Devils in the first round (17th overall) of the 2018 NHL Entry Draft, earns the honors after a dynamic season during which he scored 69 points (7G-62A) in 57 games played. He would be the second Chief to take home the WHL’s top defenseman award, joining Brenden Kichton (2012-13). 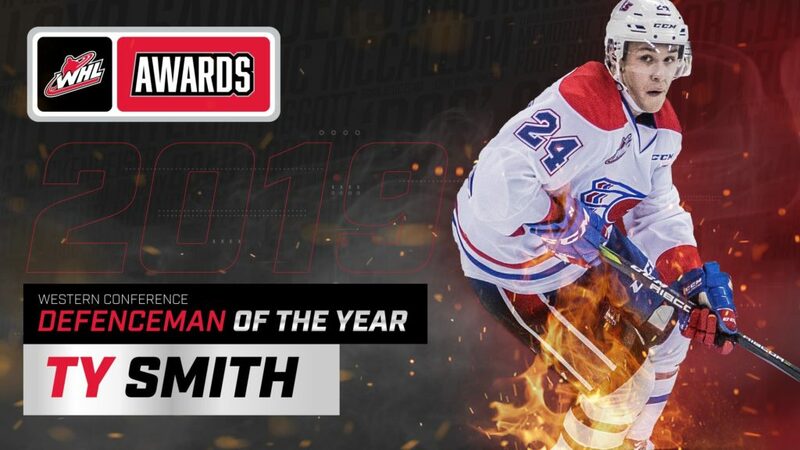 Smith is no stranger to WHL awards as he was named the league’s Scholastic Player of the Year and a Western Conference First-Team All-Star for the 2017-18 campaign. His 2018-19 campaign pushed him into sixth in franchise history for career points by a defenseman and was one assist shy of the single-season record by a rearguard. Smith ranked first among all WHL defenseman in assists and fourth in points. He competed for Team Canada at the 2019 IIHF World Junior Championship, recording three assists, including Player of the Game honors after a two-assist performance against Chiefs teammate Filip Kral and the Czech Republic. The Chiefs’ 2019 WHL Playoffs schedule begins with Games 1 & 2 versus Portland at Spokane Arena on Friday, March 22 and Saturday, March 23. Saturday night’s game will also be a Buck Night, with $1 hot dogs and Coca-Cola products at select concession stands all game long. Tickets for the playoffs are available online, over the phone at 509-535-PUCK and in-person at the Spokane Chiefs’ Ticket Office at Spokane Arena.